Ms. Hewlett has been dedicated to implementing Kick Butts Day activities. Lori Hewlett, District Chairperson and Frank Panasci, Principal Sequoya Middle School. Holtsville, NY - March 22, 2016 - The Tobacco Action Coalition of Long Island (TAC) honored Lori Hewlett, District Chairperson for Health Education at the Sachem School District as a 2016 Tobacco Control Champion. 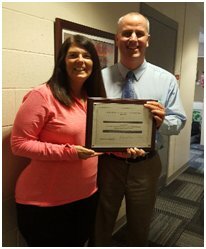 Ms. Hewlett’s leadership and dedication to implementing Kick Butts Day activities over the past several years has resulted in establishing successful annual events that have been held throughout the Sachem School District. Kick Butts Day is a national day of activism that empowers youth to speak up and take action against tobacco use at more than 1,000 events across the country. Tobacco Action Coalition of Long Island is funded by the NY Tobacco Control Program through a grant administered by the American Lung Association of the Northeast. To learn more visit BreatheFreely.org. Subject: LongIsland.com - Your Name sent you Article details of "Sachem School District Chairperson Honored as Tobacco Control Champion"